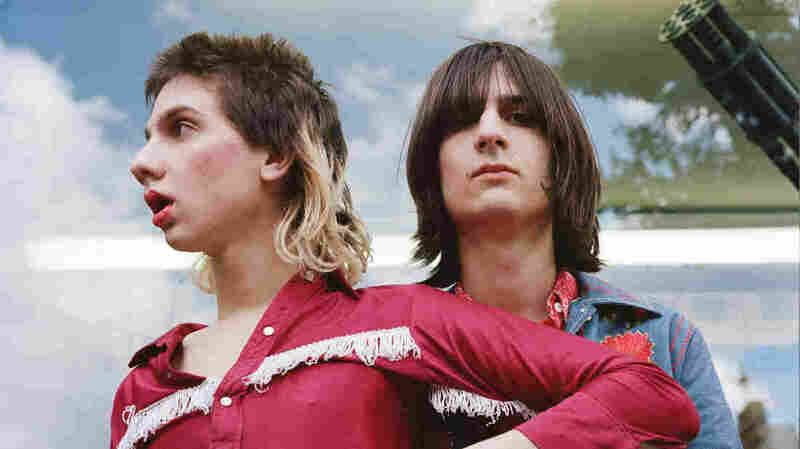 'We Just Get Out Of Each Others' Faces': The Lemon Twigs On Being Brothers In A Band Brothers Michael and Brian D'Addario are just 18 and 20 years old, but their retro, lush sound goes back decades. Their music has echoes of The Beatles, The Beach Boys, Bowie and more. Michael and Brian D'Addario, the brothers who make up The Lemon Twigs, channel sounds from decades past. The music of The Lemon Twigs has a sound that channels decades long past. Michael, 18, and Brian D'Addario, 20, the brothers who make up the band, have a look that matches: We're talking peak 1970s shag haircuts, oversized tinted aviator shades and high-waisted bell-bottom jeans. Having grown up in a musical family, the D'Addario brothers have been making music since they were tiny — starting with home videos they posted on YouTube — and have always been obsessed with The Beatles. The D'Addarios have also been on stage since kindergarten and have performed on Broadway in Les Misérables and The Little Mermaid. Michael: We just get out of each other's faces. Brian: But there's like a looming question of the fact that we split the duties and we fill up an album with half my songs and half of Michael's songs, basically. Michael: What's the looming question? I'm still waiting on the looming question. Nothing's looming. Brian: It's looming so much that I'll never get to it. Hear their full interview with NPR's Melissa Block, in which they discuss their music influences and their vision for their future, at the radio link above.